OMG! This bunny is absolutely adorable! 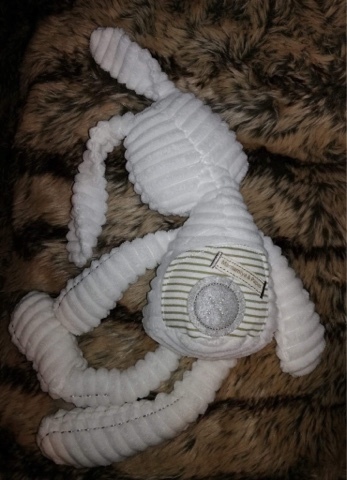 It's perfect for babies because there is no long fur or loose eyes/noses etc that your baby can pull off. 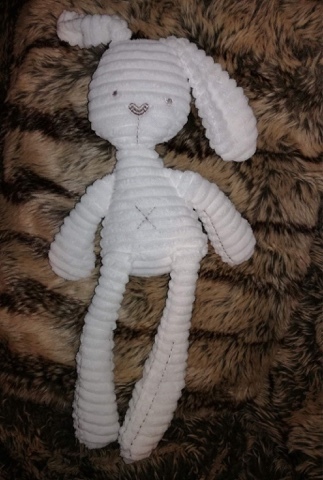 The material is very soft too, so babies will like the texture of it and enjoy cuddling Mr Bunny. The bunny is a good size, 15 inches long. It's quite big but is fairly light so younger children will still be able to hold it. It's expression is extremely cute, especially as it has one long ear and one short ear! I think this toy would appeal to both boys and girls. At under £4 this toy is very good value. It would make a lovely Christmas gift for a baby, toddler or young child - our little girl loves it! Five stars.